Is it something in the Whistler air? The kiddie like behaviour and excitement of our arrival and float plane experience seems to be continuing. 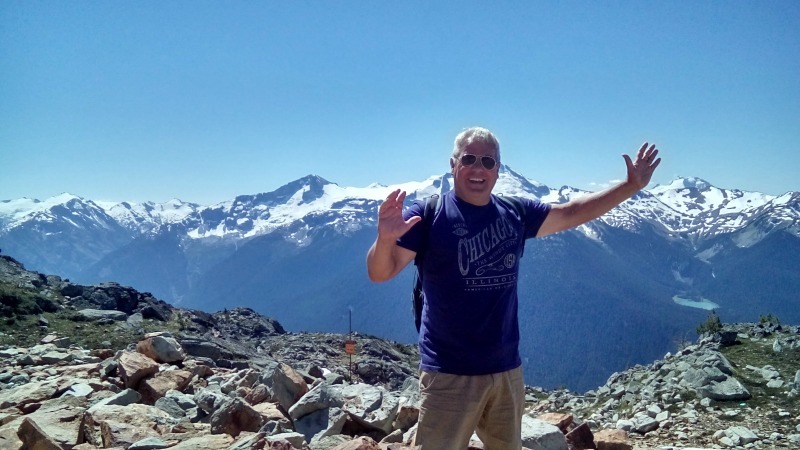 We thought we might have got it out of our system once we were on terra firma but the very next day we found ourselves buying a whole season pass to the chairlifts and gondolas that operate through the summer on Whistler and Blackcomb. No, we are not staying long term it was just a well reasoned out financial decision. A day pass was CAN $59 plus tax each (about £34) and a whole season pass was CAN $89 (about £51). Unlimited trips up the mountain and we were one of the first couple of people on the lift. Yipee! The lifts that are open here work in a sort of triangle. The best way to explain it is to use a diagram. Worlds longest unsupported lift (free) span of its kind in the world. We were offered a 10 minute wait to go across in one of the two glass bottomed gondolas. Why not? If we can hang off the side of a building on a glass floor in Chicago then we can do this. All the anticipation was wasted. The glass bottom gondola just had a panel about 4ft square in the bottom which you could peer through but not stand on. We were just relieved that we hadn’t had to wait the hour or so which is the usual average waiting time. The 11 minute trip across between the mountains, however, was great. We were trying to spot black bears all the way across. Not a sausage only a couple of marmots (which look a little like land beavers). There are between 60 and 100 bears that live on the mountain and Jon had read and re-read his Bear Smart leaflet so we, supposedly, knew what to do if we encountered one in the woods or in their favoured summer location, the village! 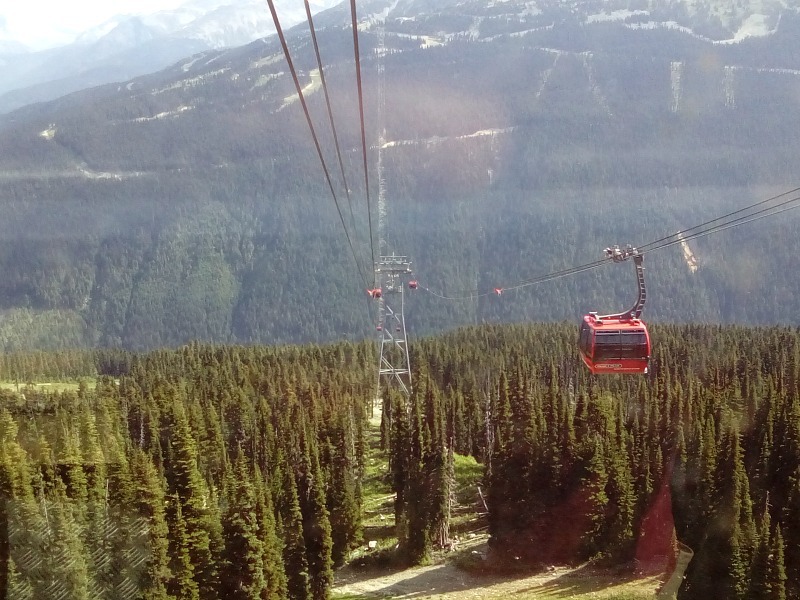 Being the kiddies we have become, we both looked at each other and said “Again!” So we did a 180 and headed back across to Blackcomb but this time in a normal gondola which seemed so much more spacious without the central barrier and glass floor. 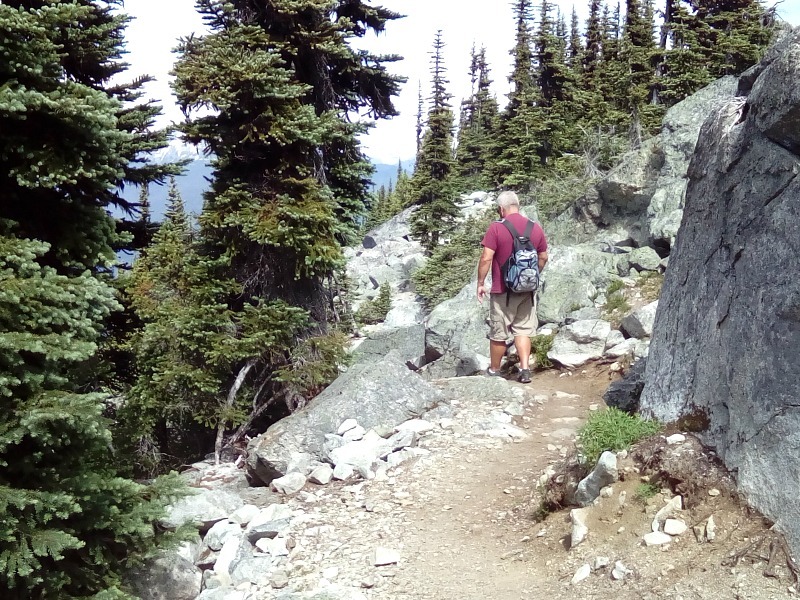 Although pure excitement had carried us back over to Blackcomb, there was an hour circular walk we wanted to do through some alpine woods and meadows. 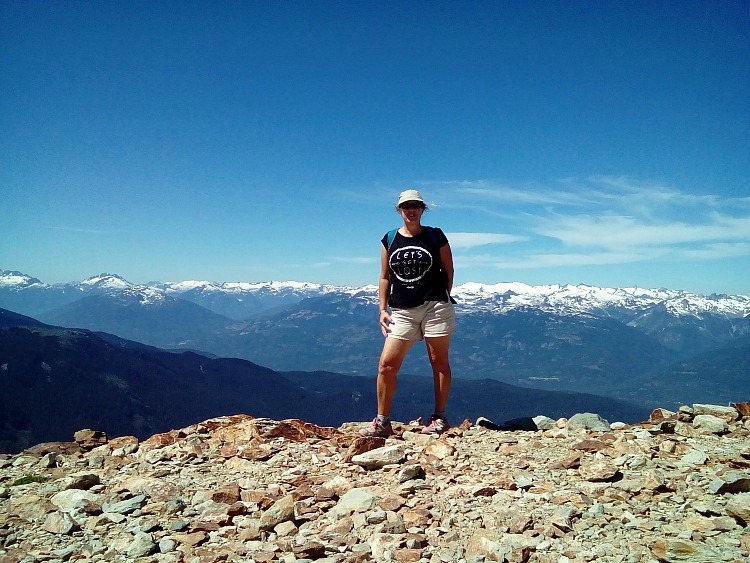 It was a very hot day which had brought the flies out so after an easy hike we arrived back at the Peak2Peak gondola station for our 2nd ride over to Whistler. We decided that we may even get out this time! The Whistler side was so much busier than the Blackcomb one. 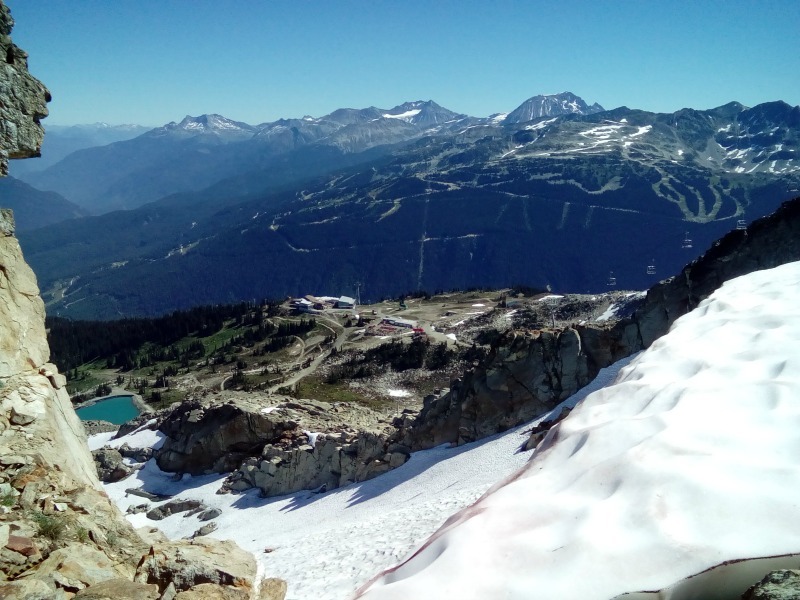 We reasoned out that it is because the Whistler Gondola is enclosed and also because it travels up from the main Whistler village not the upper village. Once again there was a large cafeteria/restaurant called the Roundhouse. 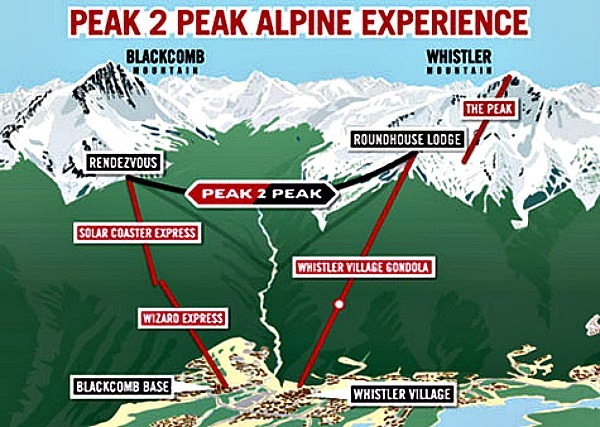 We were at about the same height that we had been on Blackcomb but on this side there is one more chairlift, the Peak Express, that takes you up almost to the summit. Did we want to go? You bet. 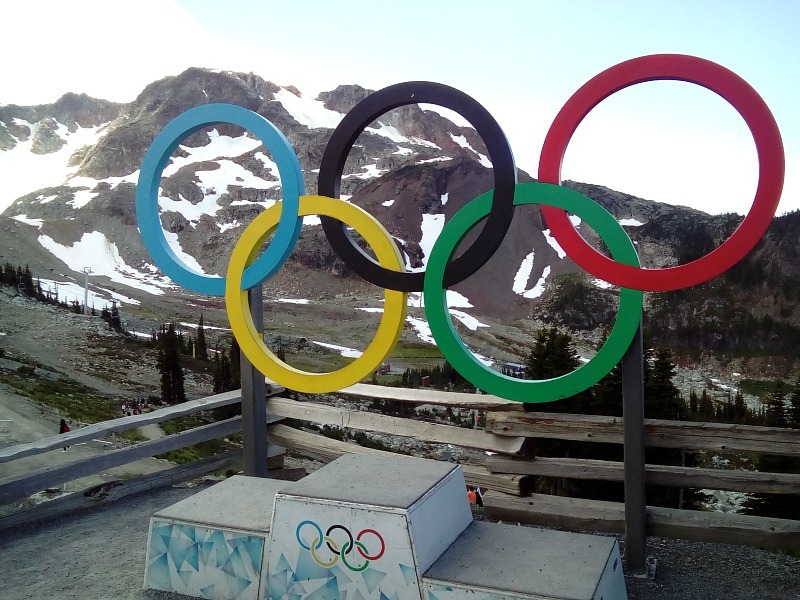 It was a 5 minute walk to the lift on the track just past the Olympics podium. Talk about leaving the best till last. The lift was steep and literally climbed up a cliff face. It was another “Again, again moment”. So we promptly did a u-turn at the top and went back down. It felt like a roller coaster going over the edge of a cliff ledge and then plummeting down towards where the lift starts. 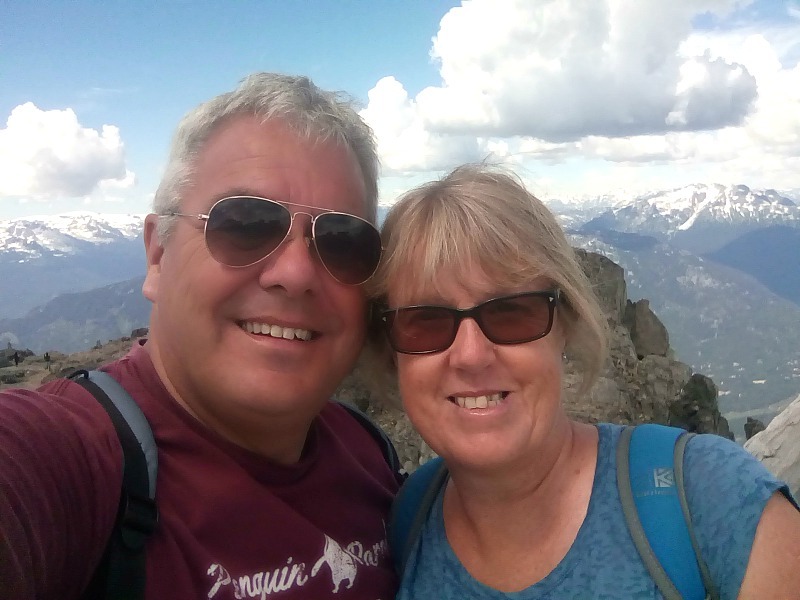 Having reached the peak a second time – we completed the short interpretive walk which basically was a clamber over the rocks around the summit with some information boards on wildlife, wildflowers and details on the surrounding mountains. 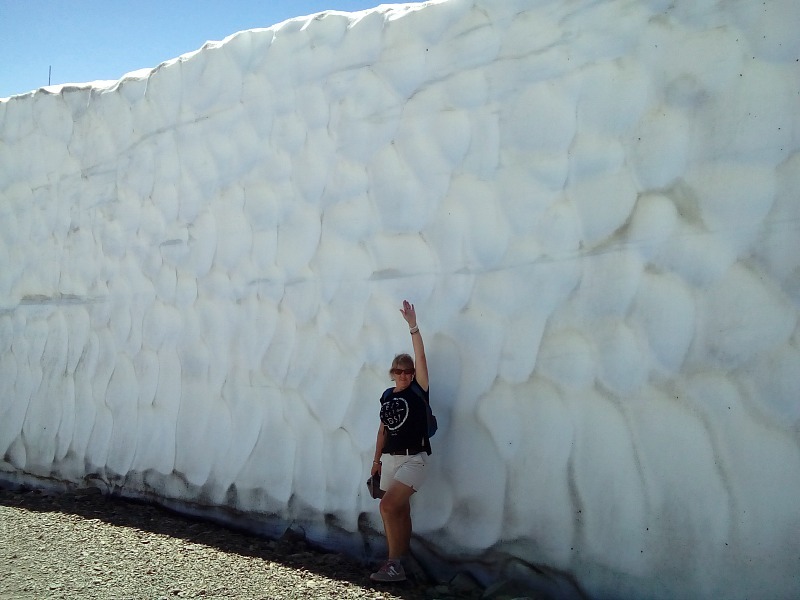 Every now and then we met a few crazy sightseers who seemed determined to climb over all the roped off areas to get a selfie. It was whilst we were having a moan about this to each other that we met a couple from Vancouver who had travelled up to the mountains for the day. He gave us some interesting stories about the mountain and recommended the Matthews and Pika Traverse route back down the mountain. Basically, we would just walk the descent of the last chairlift rather than ride on the roller coaster. Some of the descent was very steep and the only problem being a lot of loose gravel which made getting a sure footing in some places quite tricky but the views were great and it whetted out appetite to do some more hikes on the mountain, especially when we came across a few snow banks. An hour or so later we arrived back at the lift station to go back down to Whistler on the gondola. Nowhere near as exciting as being on an open chairlift but still breathtaking vistas across the valley. It such a temptation to head up the mountain everyday but we decided we should see some of the trails around the three lakes (Alta, Green and Lost Lakes). We decided to head to Lost Lake as it looked smaller and quainter than the others. A 20 minute walk, shared with the mountain bikers whizzing off in all directions, brought us to the Lost Lake Loop. As it sounds, this loop takes you around the lake but with the added advantage of being able to head down the nature trails which are only for hikers. 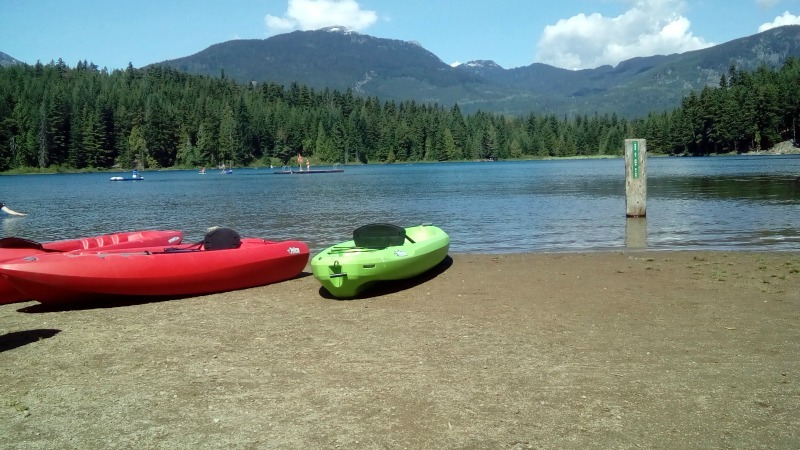 The weather was beautiful so we wandered and watched the few paddle boarders, swimmers and canoeists all enjoying the sunshine. We found a felled tree on the water edge to have our picnic on and soaked in the tranquility of the mountains and lakes. The combination of our two favourite things. 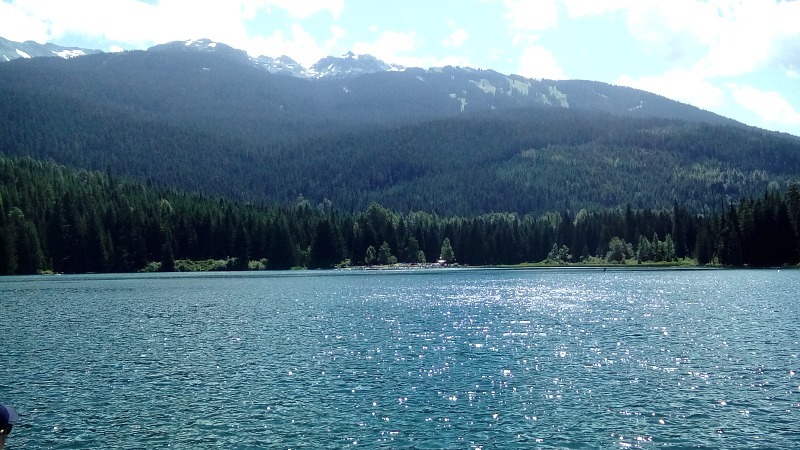 A few more nature trails running along an alpine stream brought us back to Whistler. It was around 3pm – just enough time to get one ride up and down the mountain before it closes? Definitely! So we headed to the lift station just for the sheer hell of it! Good job we did because on the descent we saw a small Black Bear foraging for food just under our chair lift. Too far away to get a photo I’m afraid and use any Bear Smart tactics but the safest way to see them and we are happy that we saw a bear in the wild. How lucky were we? What a great few days in this beautiful part of British Columbia but there has been a price to pay for all the hiking. Despite my persuasive encouragement (aka nagging) for Jonno to get some new socks to replace the thinning pieces of cotton doing a poor impression of a foot covering, he has resisted and now paid the price. 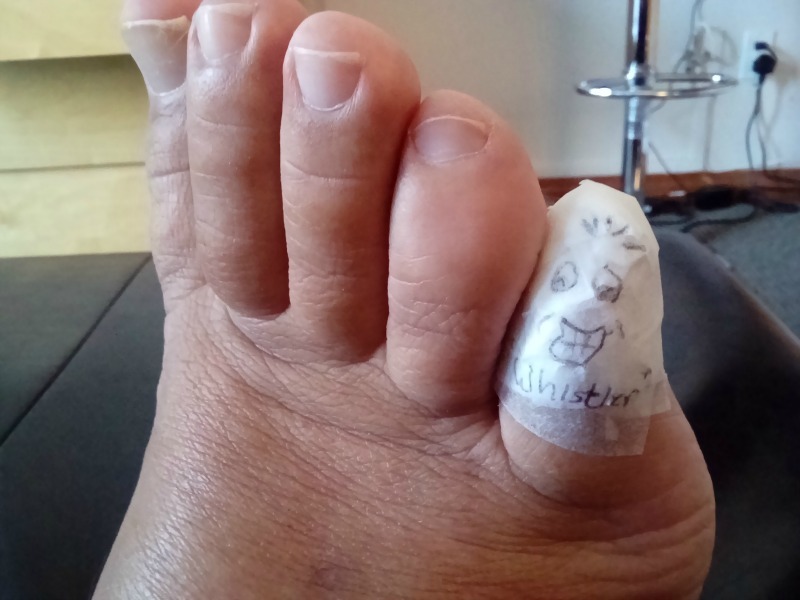 Along with our arrival at a new location, we had the arrival of a monster blister on Jon’s toe. Not to exaggerate the blister, at one point, was probably the same size as the toe itself. An ex Territorial Army Medic intervened and it is now well heeled and the only other thing I have to say on the subject is that he now has new socks!! Why go and spoil a perfectly decent blog with a picture of Ringo’s foot? I detest feet! I do however rather like the look of the mountains and the lakes and the chairlift rides and the hikes down the pass. You guys will be off panning for gold in the Klondike next! Another cracking blog Jo. Is that a bear paw with a plaster on it? Fab blog Jo. Looks beautiful. Yes my big cuddly bear called Jonno and he was a very brave bear indeed. 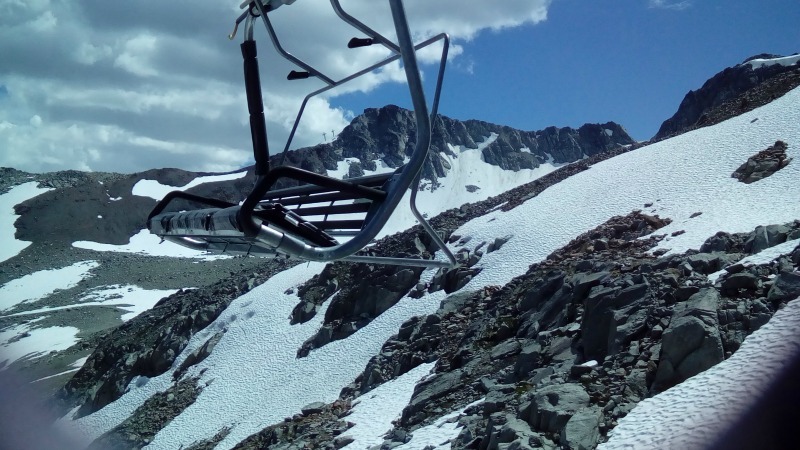 The chairlift is one of those moments when I think I will regret not doing this. I got totally absorbed in the scenery and before I knew it I was at the top. Magic!